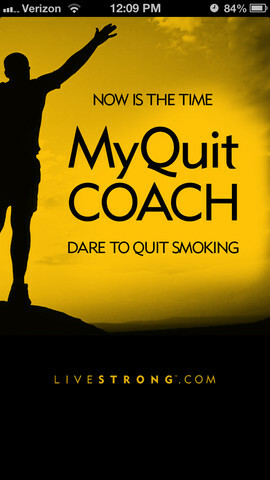 The LIVESTRONG.COM MyQuit Coach application allows you to design a personalized plan to help you quit smoking. Through this intuitive iPhone app, you'll evaluate your current status, set attainable goals and adjust preferences according to your needs. You'll have the option to choose to quit smoking right away or gradually decrease your daily nicotine intake. Personalized inspirational photos, motivational tips and progress charts will keep you on track while achievement badges will reward you for progress. And you're not alone with a built in social support circle and the ability to update your Facebook and Twitter as friends cheer you on. The LIVESTRONG.COM MyQuit Coach application has been reviewed by smoking cessation specialist Dr. Jonathan Foulds, nicotine addiction specialist Dr. Dorothy Hatsukami, psychologist Dr. Belisa Vranich and cardiologist and internist Dr. Leslie Saxon.